cardigans and kids: a breakfast recipe to start the week. a breakfast recipe to start the week. This past Saturday, a recipe of mine made it into Sew Mama Sew's 5th Year of November's Handmade Holidays. The list has been incredible of recipes and ideas for gift making. I am finally make myself a camera strap thanks to day number 18. Make sure you check them out each day - they are also offering many, many book give-aways! Growing up, even still sometimes when we visit overnight, my Mom makes us plunkin' cake. 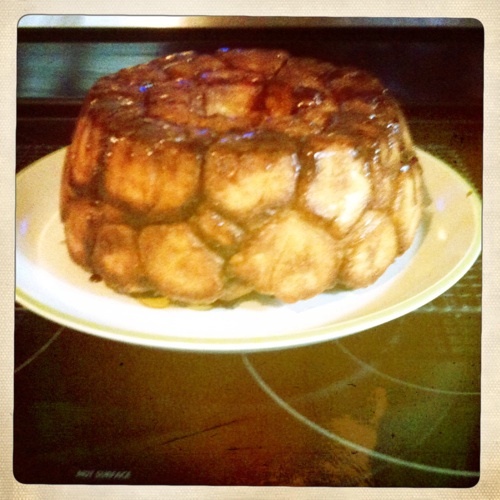 We didn't know it was also called monkey bread until she had been making it for many years. She makes hers with the biscuits (which I still love). This version has the dough from scratch, and I think worth the extra effort, but plan on getting up a little earlier to make sure it is ready to eat a a decent hour if you are serving it for breakfast. Somehow my friend Chris learned of my love of monkey bread, and will make this for us when we are getting together over a morning. I love arriving at her house at 9, ready for some amazing coffee and her monkey bread! *To warm the milk. There are 2 ways I use, either microwave for about 35 seconds, or pour milk in a small saucepan and warm just slightly above room temperature. 1. Generously spray the inside of a 10 inch Bundt pan with non-stick cooking spray. 2. Stir the yeast into the slightly warmed milk, and whisk to dissolve. 3. In the bowl of a standing mixer, with whisk, mix the flour, sugar and salt together. Add the beaten egg. With the paddle attachment or dough hook, mix until combined. Keeping the mixer on low, slowly pour in the milk/yeast mixture until combined. Add the melted butter and mix until the dough comes together. 4. At this point, you can either use the dough hook and mix on medium speed for 8-10 minutes. Or I just move the dough into a large bowl, and knead it in there for 8-10 minutes. The dough should be silky and tacky, but not sticky. It should come off the bottom of the bowl easily. 6. Line a sheet pan with parchment paper. Mix together the sugar and cinnamon in a med. sized bowl, have the melted butter and sugar mixture by the parchment lined pan. Place the dough on the pan, and push the dough into roughly an 8 in. circle. Using a knife or your fingers, cut dough into 1 - 1/12 in. pieces, rolling into balls (don't need to be perfect)! Dip each ball in the melted butter, let it drip back into the butter bowl, and then roll in cinnamon sugar. Place the balls into the the Bundt pan, layering as you go. 7. Cover and let rise again for about another hour. Preheat the oven to 350 F. Remove the plastic wrap and bake for 30-35 minutes. Until the top layer is a deep brown and the caramel coating begins to bubble around the edges. Let cool for 5 minutes, then turn it out directly onto a platter and serve warm.